Remember back in high school when you were on top of the world and knew exactly who you were and what you wanted to become? Neither do I! And Neither does Lady Bird in “Lady Bird” movie, for that matter—the titular character in Greta Gerwig’s solo directorial debut. RELATED ARTICLE: 3 Coming-of-Age Novels That Go Beyond Y.A. The wistfully confident Christine “Lady Bird” McPherson (Saoirse Ronan) is a senior at an all-girls Catholic high school in Sacramento who is about to fly the nest for what she envisions will be a liberal arts college experience that might echo the poetry of the beat generation. While far from innocent in its raw and somewhat explicit portrayal of a girl desperately trying to find herself, “Lady Bird” tells a story that we can all relate to, regardless of what walk of life we come from. “I wanna go where culture is, like New York…or at least Connecticut or New Hampshire where writers live in the woods,” she unironically pleads with her mother. In the vein of other “mumblecore” projects that Gerwig—the star of “Frances Ha”—has worked on, the humor in “Lady Bird” isn’t outlandishly over-the-top, rather it’s naturalistic enough to make you laugh at the subtle yet skillfully performed comedy while maintaining the kind of depth that will have you believe that the characters on-screen could be real people—you might even see yourself, a few revisions back, up there. While Marion indulges her daughter’s creative whims, Lady Bird’s fanciful impulsiveness repeatedly clashes with her mother’s constant criticism and quiet disappointment in what Marion perceives to be lack of direction. Lady Bird’s dream of attending an expensive private school across the country causes even more stress between the two, especially because she’s not exactly Doogie Howser (or Sheldon Cooper for a more contemporary reference)—an average student, at best. Laurie Metcalf, who is probably best known for her role as the comedically adroit (both verbally and physically) Aunt Jackie on the long-standing sitcom “Roseanne,” takes on a much more somber role in “Lady Bird” as the mom with a thousand and one responsibilities on her plate, and she does it with palpable emotional resonance while still managing to highlight the funny bits. Her talent possesses exceptional range yet, for reasons unfathomable to me, she has largely flown under the radar. 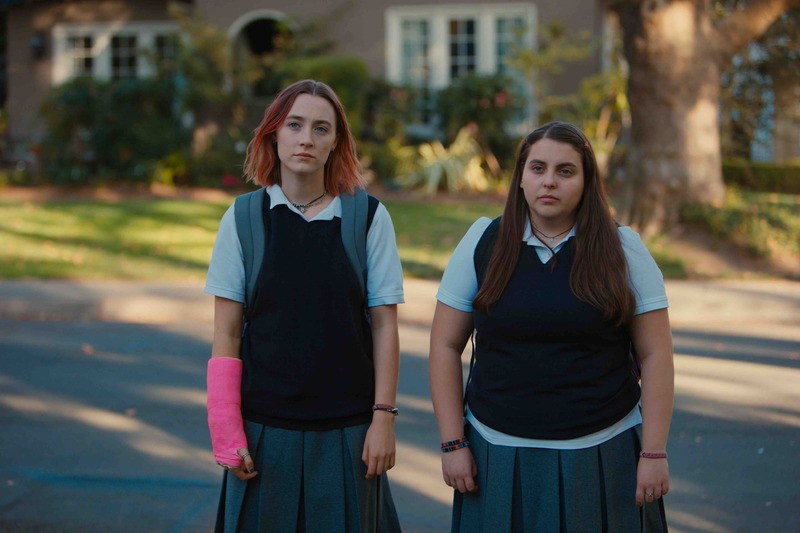 For 30-somethings, watching the quirky, coming-of-age senior year antics through the lens of Lady Bird—which take place nearly 15 years ago in 2003 (wow! what? )—is laughably but comfortingly nostalgic. As she navigates her way through boyfriend #1, college applications, a stint in an underwhelming theater production, after-school hijinks with her best friend, boyfriend #2, the wealthy in-crowd and prom, all to the musical stylings of Dave Matthews Band, Alanis Morrisette and Bone Thugs-N-Harmony, Gerwing manages to perfectly capture that fleeting era on the brink of the digital explosion. After a prom sequence worthy of a tip-of-the-hat from “Sixteen Candles” director, John Hughes, the day she’s been dreaming of finally arrives and Lady Bird finally leaves for college. One of the last exchanges she and her mother share is a heartbreakingly honest one. Marion appears disheartened and struggles for a reply that never comes. The mother/daughter dichotomy in “Lady Bird” is representative of a larger struggle that lives inside of many of us. It’s the unadulterated, anything-is-possible, creative spirit that wants to take on the world full-force that gets tempered by a more pragmatic lifestyle which understands the need to make a living so that we can pay the rent and eat, and it’s hard to deny either approach entirely. It isn’t until the college-bound young adult flies across the country to start her new, independent life that Lady Bird starts to regret the fraught relationship between herself and her mother and even misses the suburban Sacramento experience that, not long ago, she mocked mercilessly and couldn’t wait to escape. Peeking into a cathedral where a church choir is rehearsing becomes a little reminder of high school, of home, serving as a kind of safety blanket and bringing her the kind of comfort and understanding you don’t feel until you’ve shed the secure confines of your past for the come-what-may of the next great personal venture. Just don’t forget to call home once a week to check in. Lady Bird is now playing at a theater near you. Visit tickets.ladybird.movie for details and more information. Netflix’s “Stranger Things” is more than just a retro, binge-worthy homage to ‘80s sci-fi—it is defining the way stories can be told in the 21st century.